The fiercely energetic and empowering martial arts based cardio workout supported by driving music and powerful role model instructors. Virtual classes are included in all multi-memberships and those where customers have selected classes as part of their duo option. Find out about Get Active Discount Cards. Find out more about our leisure memberships. Classes must be booked in advance, we suggest you book early to avoid disappointment. When calling to book a place on a fitness class it is vital that you speak to a member of staff in order to have your place allocated. Leaving a voicemail simply gives us an opportunity to return your call and cannot be accepted as confirmation of a place. Please note individual opening times of centres vary, please consider this when attempting to book a place on a class. Please note you must be aged 14 or over to attend one of our classes. Those under the age of 16 must be accompanied by an adult. By taking part in a virtual class, you are declaring that you are fit to do so. Should you have any concerns about a medical condition that may affect your ability to exercise, please consult a medical professional. Please make sure you arrive at the studio in plenty of time so that you can take part in the session from the beginning. Dropping in mid-way through a class is not allowed - the warm up is a vital part of the class. 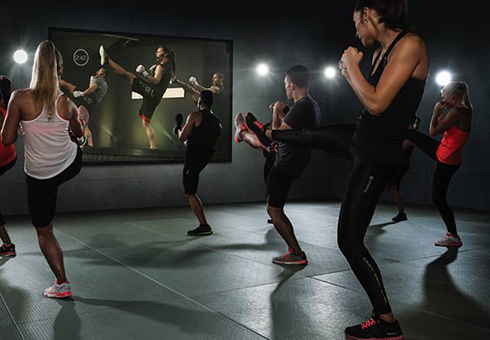 Find out more about Les Mills Virtual fitness classes. A fiercely energetic and empowering martial arts based cardio workout.